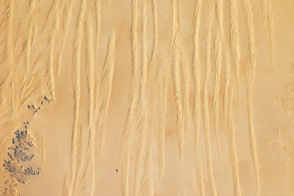 This detailed astronaut photograph, taken from low earth orbit, shows classic large and small sand masses of the central Sahara Desert, where wind is a more powerful land-shaping agent than water. 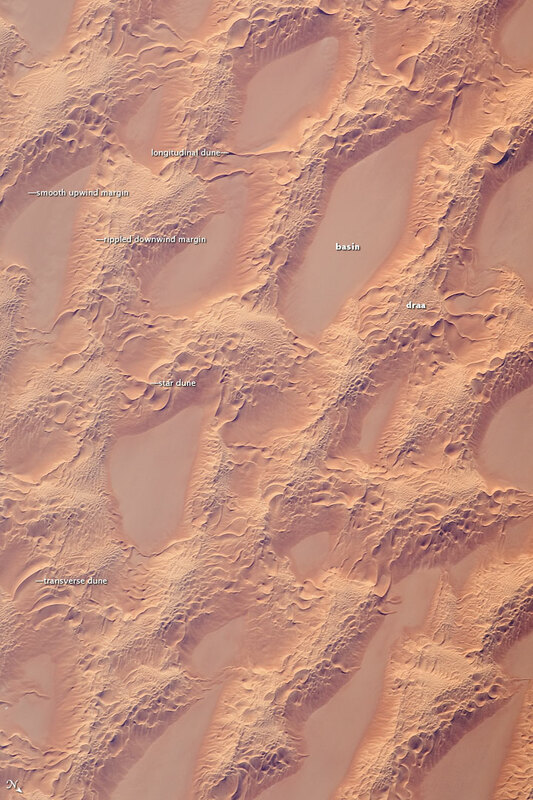 “Draa” dunes (from the Arabic for “arm”) are very large masses of sand, and they appear here as the broad network of yellow-orange sand masses, with smooth-floored, almost sand-free basins between them. These sand masses lie in the western part of Libya’s vast Marzuq Sand Sea (centered at 24.5 degrees north, 12 degrees east). Geologists think that the draa of the Marzuq were probably formed by winds different from the prevailing north-northeast winds of today. Numerous smaller dunes have developed on the backs of the draa. Three distinct dune types are visible: longitudinal dunes, which are more or less parallel with the north winds; transverse dunes, which are usually more curved and formed at right angles to the wind; and star dunes, in which several linear arms converge towards a single peak. The upwind sides of the sand masses appear smoother than the downwind side. Wind is moving sand grains almost all the time. This means that the draa and the dunes are all moving as sand is added on the upwind side and blown off the downwind side. Small sand masses move much faster than large sand masses. The draa are almost stationary, but the smaller dunes move relatively quickly across their backs. When the smaller dunes reach the downwind side of the draa, they are obliterated; their sand is blown across the basins as individual grains. Astronaut photograph ISS018-E-14770 was acquired on December 20, 2008, with a Nikon D2Xs digital camera fitted with a 400 mm lens, and is provided by the ISS Crew Earth Observations experiment and Image Science & Analysis Laboratory, Johnson Space Center. The image was taken by the Expedition 18 crew. The image in this article has been cropped and enhanced to improve contrast. Lens artifacts have been removed. The International Space Station Program supports the laboratory to help astronauts take pictures of Earth that will be of the greatest value to scientists and the public, and to make those images freely available on the Internet. Additional images taken by astronauts and cosmonauts can be viewed at the NASA/JSC Gateway to Astronaut Photography of Earth. Caption by M. Justin Wilkinson, NASA-JSC. 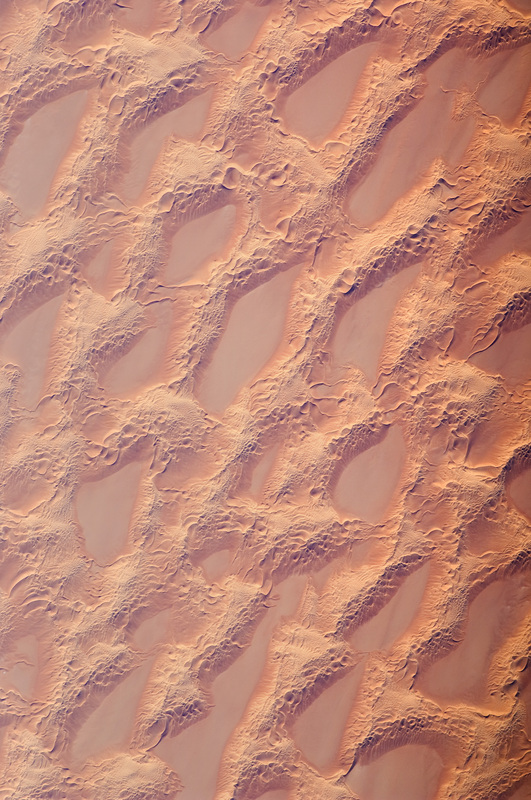 This astronaut photograph shows classic large and small sand masses of the central Sahara Desert, where wind is a more powerful land-shaping agent than water.